Four groups of people paid as great a price as anyone to live in America….Native Americans, Scots-Irish, Chinese, and Mormons. My own ancestors watched their homes and farms burn as they were driven out of Far West, Missouri and Nauvoo, Illinois. I have never been, a church going Mormon, but I am extremely proud of my ancestors and their accomplishments. The Mormon pioneers not only “made the desert bloom”, they did it without government funding. None of the displaced Mormons filed lawsuits against the states of Missouri and Illinois for destroying their homes and farms, or for violating their civil rights with an extermination order. “On the 27th of October, 1838, Missouri Governor Lilburn W. Boggs signed the Mormon extermination order. The order declared, “The Mormons must be treated as enemies, and must be exterminated, or driven from the State, if necessary for the public peace”. This military directive forced a Mormon exodus from Missouri of approximately ten thousand men, women and children. The vast majority of the Missouri Mormons resettled in Nauvoo, Illinois…my great-great-great grandparents Patty and David Sessions lost twelve hundred dollars in land and four hundred dollars in livestock and corn when they were driven from Missouri in 1838. Leaving their Missouri farm in the depths of winter, they stayed at one place on the road for fourteen days with nothing to eat but parched corn. For the next seven years, Mormon converts came to Nauvoo, Illinois. Within a few years, Nauvoo had a population of twenty thousand, rivaling Chicago as the two largest cities in Illinois. The rapid growth of church membership, financial success of both members and the Mormon church, polygamy, and a well armed militia (Nauvoo Legion), fueled the intolerance by non-Mormons. While jailed in Carthage, Illinois, the leader of the Mormon Church, Joseph Smith and his brother Hyrum, were killed by a mob on June 27, 1844. The hatred and bigotry continued. In 1845, more than two hundred Mormon homes and farm buildings were burned in an attempt to force the Mormons to leave Illinois. By 1846, mob violence forced the church leadership to announce the Mormons would leave Nauvoo for the West. We would esteem a territorial government of our own as one of the richest boons of earth, and while we appreciate the Constitution of the United States as the most precious among the nations, we feel that we had rather retreat to the deserts, islands or mountain caves than consent to be ruled by governors and judges whose hands are drenched in the blood of innocence and virtue, who delight in injustice and oppression. Thus, they walked (quoted in B. H. Roberts, A Comprehensive History of the Church, 3:89-90). …we do not want one saint left in the United States. Let every branch in the east, west, north, and south be determined to flee by either land or sea. On February 4th, 1846, Samuel Brannan took two hundred and thirty-eight men, women and children aboard the Brooklyn to sail from New York City to Yerba Buena (San Francisco). The arrival in San Francisco of the Mormon emigrants doubled the population. Over the next two years, more than one hundred buildings were constructed by the new emigrants laying the foundation for the boomtown to develop during the California gold rush. By mid-February the exodus from Nauvoo was underway. While crossing Iowa, several settlements (Garden Grove, Mt. Pisgah) were built and crops planted by the first wagon trains. These towns were built to serve as way stations and re-supply points for the Mormons to follow. By the middle of May (1846), it was estimated sixteen thousand Mormons had left Nauvoo and crossed the Mississippi River. Many of them stopped to help establish the towns and farms in Iowa, but eventually all were headed for the Salt Lake Valley. The winter crossing of the rivers, streams, creeks and bogs of Iowa was the hardest part of the Mormon migration. Upon reaching the Missouri River, settlements were started on both sides of the river Kanesville (Council Bluffs) on the Iowa side and Winter Quarters on the west side. Winter Quarters was in the area of present day Omaha, Nebraska. In December of 1846, Winter Quarters boasted five hundred and thirty-two log homes, eighty-three sod houses, and an untold number of tents and wagons used for shelter. Winter Quarters population was close to four thousand. Inadequate shelter and food at Winter Quarters during the winter of 1846-47 resulted in approximately four hundred Mormons dying of malaria, scurvy, dysentery, and a host of other unidentified ailments. In 1846, five hundred volunteers formed the Mormon Battalion to serve in the 1846-1848 Mexican War. The pay of the battalion, seventy thousand dollars, helped fund the Utah exodus. Brigham Young gathered all the information possible on the Salt Lake Valley and the Great Basin while in Nauvoo and later at Winter Quarters. Mountain Men and a Jesuit missionary, Father Pierre de Smet stopped at Winter Quarters; they provided useful information about the Great Salt Lake Valley. Despite Samuel Brannan and some mountain men advising against the semi-arid valley, Brigham Young’s insisted the Mormons settle a place no one else wanted. The Great Salt Lake area met the requirement in all respects. The Mormon migration was not a blind, wandering trek across the Plains. It was a carefully planned and organized journey to the Great Salt Lake Valley. 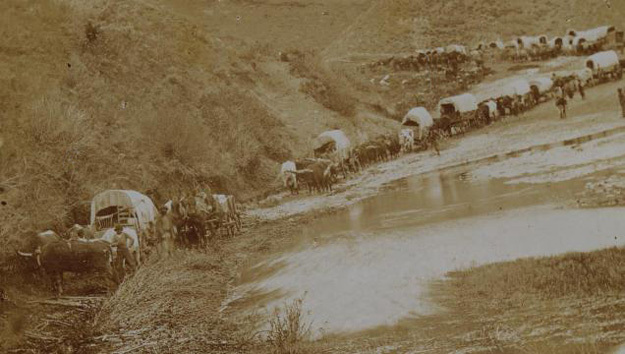 Unlike most wagon trains, the Mormons did not use any Mountain Man guides. For the Pioneer Party, Brigham Young and his advisers sought builders, mechanics, masons, and resolute men to form the Mormon vanguard that would push the frontier beyond the Rocky Mountains. Chauncey Loveland a fifth generation grandfather was a member of the Pioneer Company. Three negroes accompanied the Pioneer Party, Green Flake, Hark Lay, and Oscar Crosby. As the Pioneer Party was getting ready to leave for the Great Salt Lake Valley, John Taylor arrived with five hundred dollars worth of astronomical instruments and other technical equipment to provide accurate trail locations for future companies. The scientific equipment included two sextants, one circle of reflection, two artificial horizons, two barometers, several thermometers, and telescopes. Brigham Young and the pioneer party left Winter Quarters on April 5th, 1847 for the Salt Lake Valley. The Pioneer Company (Camp of Israel) consisted of one hundred and forty-three men, three women, and two children. The company had seventy-two wagons, ninety-three horses, fifty-two mules, sixty-six oxen, nineteen cows, seventeen dogs, and some chickens. The three women were Harriet Page Wheeler Young (wife of Lorenzo D. Young), Clarissa Decker Young (wife of Brigham Young) and Ellen Saunders Kickball (wife of Heber C. Kimball). The two children were Isaac Perry Decker and Lorenzo Sobieski Young. Over the next ten years, thousands of Mormons traveled by wagon train over the Mormon-Oregon trail to the new “Land of Zion”. Mormon pioneers traveling over the trail improved it and built support facilities for those to follow. Ferries were established to help finance the Mormon migration. By 1856, the number of Mormon converts reached the point where wagon trains were too expensive. Brigham Young decided the easiest, cheapest, and fastest way for large numbers of converts to reach the Salt Lake Valley was by handcarts. Five handcart companies were organized in 1856 to make the thirteen hundred mile trip from the railroad terminus at Iowa City, Iowa, to Salt Lake City. The first three handcart companies arrived in Salt Lake without problems, but the last two, the Willie Handcart Company and the Martin Handcart Company were trapped by deep snow and blizzards between Independence Rock and South Pass. The Willie and Martin Handcart companies had a total of nine hundred and eighty people with two hundred and thirty-three handcarts. Two hundred and fifty people died during the handcart period, two hundred and twenty were in the Willie and Martin Handcart companies. Despite the losses from the Willie-Martin Handcart Companies the handcart companies continued until 1860. Ten handcart companies made the journey from Iowa City and Florence (1857-1860), Nebraska to the Salt Lake Valley. Over the five year period of the Mormon Handcarts companies, two thousand, nine hundred and sixty-two immigrants walked over the Mormon Trail to Utah. The move West was considered by church leaders as early as 1842. Oregon, California, and Texas were potential destinations. In 1844, Joseph Smith obtained John C. Fremont’s map and reports describing the Great Basin and the Salt Lake Valley, which at the time Brigham Young started West in 1847 belonged to Mexico. None of the information gathered at Winter Quarter, or from mountain men along the way, had any effect on Brigham Young’s goal of settling the Great Salt Lake Valley. Brigham insisted from the start the Mormons would settle in a place no one else wanted. As is evident today, the “desert bloomed” under Brigham Young’s leadership. Just over South Pass at Pacific Spring, Mountain Man Moses “Black” Harris informed the Mormons the Salt Lake Valley was sandy and destitute of timber; no vegetation but the wild sage. Harris gave Brigham’s Party past issues of the Oregon Spectator, the first newspaper published on the Pacific Coast, and a number of copies of the California Star published by Samuel Brannan. Soon after the meeting with Harris, the Pioneers met “Peg Leg” Smith, who had a post near Bear Lake and then Jim Bridger from Fort Bridger. On June 30th in the Green River Valley, Samuel Brannan rode into the Camp of Israel. He gave the Pioneers an account of the Brooklyn voyage to California, and told them of the Donner Party disaster from freezing temperatures and lack of food in the Sierra Nevada Mountains. Brannan tried to convince Brigham Young of the virtues of going on to California. Samuel Brannan started San Francisco’s first newspaper, the California Star. California’s first millionaire, Samuel Brannan fell from Mormon grace and died in poverty from alcoholism from alcoholism. West of Fort Bridger, the Pioneer Party met Miles Goodyear. As the other mountain men had done, Goodyear downplayed the Salt Lake Valley as a place for the church. During a lengthy conversation, Goodyear mentioned his “farm”, Fort Buenaventura in the Bear River Valley (Ogden, Utah). The exodus of the Mormons from Nauvoo, Illinois to the Valley of the Great Salt Lake occurred in two segments. The first segment, across Iowa to the Missouri River in February of 1846, took over four months to cover two hundred and sixty-five miles. The second segment, from the Missouri River to the Valley of the Great Salt Lake, covered one thousand and thirty-two miles in four months. During the first segment from Nauvoo to Winter Quarter, Brigham Young finalized his plan for the mass movement of wagon trains. The wagon train people were organized into companies of hundreds, fifties, and tens. This division was based on able bodied men. The Mormon Trail across Nebraska and Wyoming followed previously used emigrant trails. For the first part of the trail, the Mormon trail was north of the Platte River whereas the Oregon-California Trail was on the south side. As the Mormon wagon trains traveled west, ferries were built and the stream crossings were improved for the trains to follow. The first wagon train to use an odometer was Brigham Young’s Party in 1847. 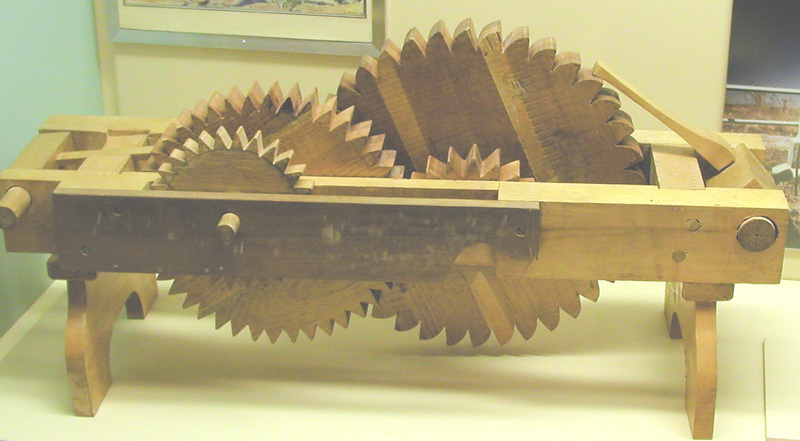 Based on William Clayton’s suggestion, Orson Pratt designed a device to fit on the axle of one of Heber C. Kimball’s wagons. A wheel odometer measured rotation of the wagon wheel, and from this the distance traveled could be determined. 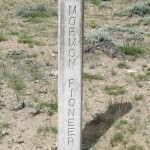 The odometer was not unique to the Mormons, but they were the first to use one on the Oregon-Mormon trail. The Pioneer Party spent one hundred and twenty days on the trail. The average distance traveled was eight an a half miles per day. Three of the five handcart companies from Iowa City, traveling roughly three hundred miles farther, averaged one hundred and twelve days to reach the Salt Lake Valley. With the exception of the Martin and Willey Handcart companies, the handcarts traveled faster than the wagon trains from Winter Quarters. The Mormon Trail from Fort Bridger followed the trail of the Donner-Reed Party through the Wasatch Mountains. The final one hundred and sixteen miles, from Fort Bridger to the Valley of the Great Salt Lake, was the most difficult of the second stage migration. An advanced group of the Pioneer Party arrived in the Salt Lake Valley on July 22, 1847. Brigham Young, who was sick, arrived two days later on July 24, 1847. On July 23, the advanced company moved to (present day) Four Hundred South and State Street (where the Salt Lake City-County Building now stands). William Carter, George W. Brown. and Shadrach Roundy shared the honor of plowing the first furrows in the Valley of the Great Salt Lake. “Weak and weary as I am, I would rather go a thousand miles farther than remain in such a forsaken place as this.”…in 1892, when my grandmother first saw the log cabin on my grandfather’s homestead in Star Valley (near Thayne, Wyoming), she hesitated for sometime before saying, “Nobody lives in a place like this.” Just as the “desert bloomed”, Star Valley is now regarded as one of the most beautiful valleys in the West. Mormons were not the first white settlers in the Great Salt Lake Valley. In 1844-45, Miles Goodyear established Fort Buenaventura on the Weber River in present day Ogden, Utah. Not wanting any other settlers in the Great Salt Lake Valley, the Mormons bought the property from Goodyear, who claimed to have a deed from the Mexican Government. In reality the Mormon Church paid Goodyear one thousand nine hundred and fifty dollars for nothing more than Goodyear’s squatters rights to the land. James Brown moved into the fort in 1848 and renamed it, Fort Brown. My great-great grandfather, Perrigrine Sessions traveled the one thousand and thirty-two miles from Winter Quarters to the Salt Lake Valley in 1847. He was a Captain of Fifty in the second wagon train to arrive in the Salt Lake Valley…fifty able bodied men with their families would be over two hundred people. The second wagon train of 1847 consisted of six hundred and sixty wagons with 124 horses, 9 mules, 2,213 oxen, 887 cows, 358 sheep, 35 hogs, and 716 chickens (City of Bountiful, Leslie Foy). On reaching the Salt Lake Valley, Brigham Young sent Perrigrine north with many of the large grazing animals to keep them away from the newly planted crops. Perrigrine and his family spent the winter of 1847-48 with their wagon backed up to the bank of Big Hollow (250 West 2nd North in present day Bountiful). The original name for present day Bountiful, Utah, was Sessionsville. In 1855, the name of the settlement was changed from Sessionsville to Bountiful. 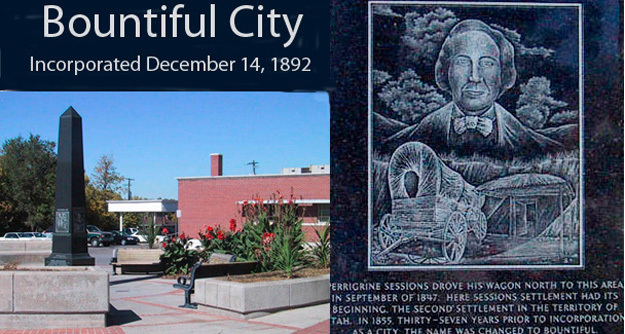 A monument was erected in 1995 in front of the post office on the corner of Main and Center streets in Bountiful, Utah to honor Perrigrine Sessions. One of Perrigrine’s wives, Sarah Crossley, came to Utah in 1856 with the Martin Handcart Company. The Martin Handcart Company was stranded in heavy snow and cold not far from Devils Gap at Martins Cove. Sarah Crossley’s account of the suffering is guaranteed to bring a lump in your throat, or a tear to your eye. My great-great-great grandparents, David and Patty Sessions were called to go with the first company to clear a road between Nauvoo, Illinois and the Missouri River. Patty was given the responsibility of midwifery. Among the hundreds of pioneers leaving Nauvoo, Patty delivered nine babies on the bank of the Mississippi River. The next summer at the age of fifty-two, Patty Bartlett Sessions walked beside an ox team in her son Perrigrine’s company from Winter Quarters to the Salt Lake Valley. Besides driving the ox team, Patty kept a complete day diary, delivered babies, and treated the sick. Upon arriving in Utah, “Mother Sessions” delivered the first male baby born in the Salt Lake Valley. Known as the Mormon-Midwife, Patty Bartlett Sessions delivered three thousand nine hundred and seventy-seven babies. She died at the age of ninety-seven. To put this number of deliveries in perspective, Dr. O. L. Treloar practiced (only doctor during World War II) in Afton (Star Valley), Wyoming for over thirty years. During this time, Dr. Treloar delivered just over three thousand babies in a predominately Mormon community. …Salve for old sores: Bark of indigo weed root, boiled down beeswax, mutton tallow, a very little rosin. …For jaundice: Take one tablespoonful of castile soap shavings, mixed with sugar, for three mornings; then miss three until it has been taken nine mornings a sure cure. …For bowel complaint: take one teaspoonful rhubarb, one fourth carbonate soda, one tablespoon brandy, one teaspoon peppermint essence, half-teacupful warm water; take tablespoonful once an hour until it operates. …For vomiting: Six drops laudanum, the size of a pea of soda, two teaspoons of peppermint essence, four cups water; take a tablespoonful at a time until it stops it; if the first does, don’t repeat it. …Heart-burn: Laudanum, carbonate soda, ammonia, sweet oil, camphor. Also for milk leg inflammation or sweating. …For gravel: dropsy and for fits: Indian hemp root. …For gravel: wild rose berries boiled long. Drink the tea. …Eye water cure: wrap two eggs in a wet cloth and roast them till quite hard, then grate or grind them fine, add half ounce white vitriol, mix it well together, add one pint of warm rain or snow water and keep it warm for three hours, after stirring or shaking it. strain it through a fine thick flannel and bottle it up for use. A book on Patty Sessions…Mormon Midwife The 1846-1888 Diaries of Patty Sessions, Donna Toland Smart, editor…was the Winner of the 1997 Evans Handcart Prize. The Church Historians Press has published a book entitled: Saints At Devil’s Gate. The book contains landscapes along the Mormon Trail with comments by a Pioneer at the location of the painting. It is interesting to read the thoughts of people that were actually there. Two of the comments were from Patty Sessions. A slight mistake was made in her name, it was listed as Martha (Patty) Bartlett Sessions. I like to think my interest in western history comes from my mother and my ancestors. Between 1847 and 1854, every Grandfather and Grandmother in my direct-line ancestry traveled over the Mormon Trail (thirty-two in all). The oldest, John Parker, was eighty-two, and the youngest was my maternal great-grandfather, Mathew Gilby. Mathew had his fourth birthday in August of 1851, while walking to Utah. 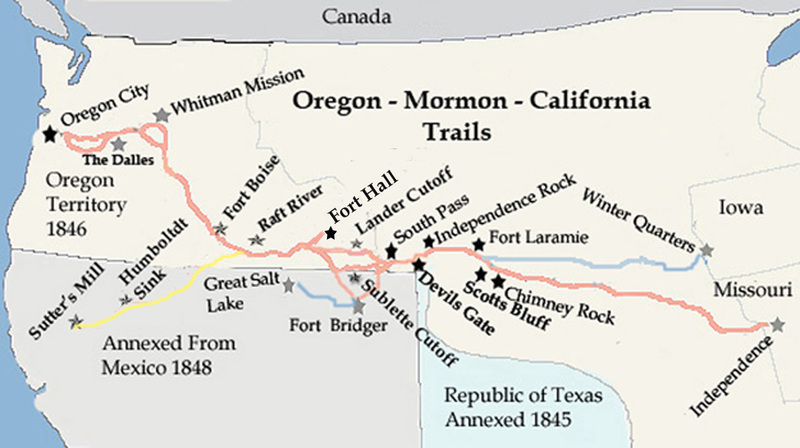 The use of the Oregon-Mormon trail by the Mormons lasted from 1847 to 1869. Seventy thousand Mormons traveled over the trail during this period. Use of the Mormon Trail stopped in 1869 with the driving of the “golden spike” at Promontory Point, Utah, for the transcontinental railroad. In July 1849, Church Authorities wrote a constitution for statehood; the U.S. Constitution and the Iowa Constitution of 1846 were used as guidelines. 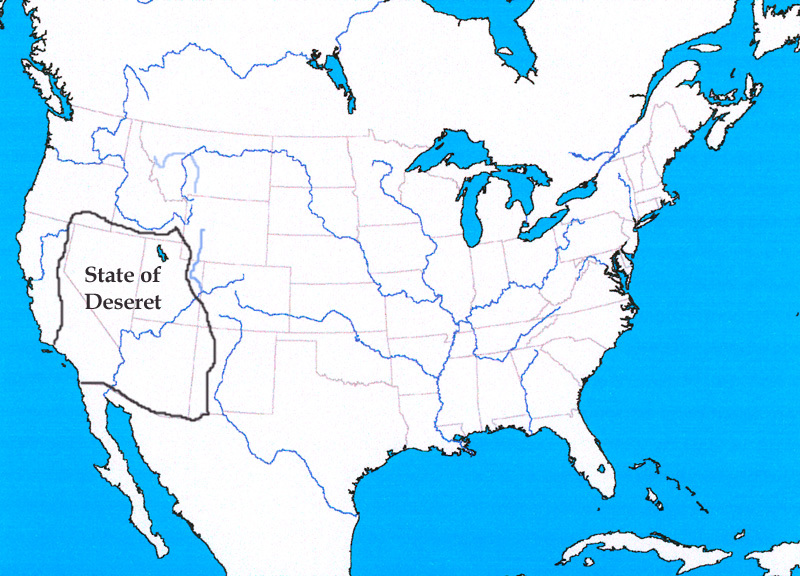 The proposed state boundaries were set at: Oregon on the north, Green River on the east, Mexico on the south, and the Sierra Nevada on the west, including a portion of the Southern California seacoast…there are several variations to this map, but regardless, if approved the State of Deseret would have been the first or second largest state in the Union. When Church Authorities petitioned Congress for a new state, they requested the state be named Deseret. Congress turned down the proposed State of Deseret, primarily because of the practice of polygamy. There is a great deal more general Mormon trail trivia in the Oregon Trail article. The Mormon Trail article was written by Ned Eddins of Afton, Wyoming. To return to the Home Page Article Links Link Bars click on Mountain Man logo. Hafen, LeRoy R., and Ann W. Hafen. Handcarts to Zion: The Story of a Unique Western Migration, 1856-1860. Vol. 14 of the Far West and the Rockies Historical Series. Glendale, Calif. 1960. Lund, Gerald N. Fire Of The Covenant. Bookcraft Publishing, Salt Lake City, Utah. 1999. – an excellent book. Patty Bartlett Sessions’ forty year Diary. Schindler, Harold. Camp of Israel. Salt Lake Tribune web site, 1997. Schindler, Harold. Handcart Company Articles (several). Salt Lake Tribune web site, 1997. Mormon Midwife The 1846-1888 Diaries of Patty Bartlett Sessions. Edited by Donna Toland Smart. Utah State University Press. Logan, Utah. 1997. Exemplary Elder The Life and Missionary Diaries of Perrigrine Sessions 1814-1893. Edited. by Donna Toland Smart. BYU Studies and Joseph Fielding Smith Institute for Latter-day Saints History. Provo, Utah. 2002.